Background: Diabetes is one of the most rapidly increasing disease in the contemporary context. Its rapid global rise indicates that its cause are possibly closely associated with the routine lifestyle and eating habits. Diabetes is also possibly the medical condition, which presents with a preclinical phase having a possibility of reversal if its possible causes can be seriously understood and eliminated. Experiences of diabetes management so far had not been very promising either in prevention of its incidence or spread and prevention of its complications. Aims and Objective: In this case, preventing diabetes by attempting to identify the risk factors and then proposing the ways to avoid them could be a most pragmatic way forward. Material and Methods: This study has attempted to associate Ayurvedic causes of Prameha with diabetes in a matched case–control manner (n = 24) and has shown the high association of diabetes with a few relatively less known causes such as stress (odds ratio [OR]: 7.86:1), anger (OR: 5.9:1), and excessive exposure to high ambient temperature (OR: 4.6:1). Results: Among the causative factors showing a high OR, stress and anger were particularly found statistically significant (P = 0.0173 and 0.0145, respectively). Conclusion: On the basis of these results, this can be proposed that if such studies are done on larger basis and possibly in a prospective cohort manner, it can open a completely new area of identifying the risk factors to diabetes. Such revealing knowledge will not only help us knowing about diabetes better but also definitely help us to prevent diabetes to a large extent. The WHO predicted 50% increase in deaths from diabetes over the next 10 years and by 2030, predicts it to be the 7th leading cause of death worldwide. Existing treatment strategies have been unable to stop the progressive course of diabetes and to prevent the development of its chronic complications. This current scenario of diabetes is likely to worsen in the coming decades. A pragmatic way to deal with diabetes could therefore be its absolute prevention by avoiding the risk factors and selective prevention by getting alarmed of the warning signs during the prediabetic stage. Such prevention in Indian context seems more worthy by knowing that India has 10%–15% prediabetes prevalence with possibly world's highest prediabetes into diabetes conversion rate (18% prediabetic every year in India convert into overt diabetes). Diabetes onset in India is nearly two decades earlier comparing to rest of the world. This further warrants the possibility of a more aggressive diabetes phenotype pertaining to this very part of the globe. How the prediabetics may be prevented from being converted into overt diabetic? To find a strategic reply for this question, it is need to understand that how the prediabetes is screened and diagnosed conventionally. Prediabetes is actually the stage of erratic glucose tolerance in response to food. Overtly, this is a subclinical condition, marked only by subtle blood sugar level changes although a bit higher but have not reached to the level qualifying to be called as diabetes. During this stage, there are no obvious clinical features which may eventually be called as warranting or alerting signs which can actually help the patient to understand about the possible impending doom in the form of diabetes. Interestingly, Ayurveda in reference to Prameha, a clinical entity having resemblance to diabetes, presents a vivid description about disease Purvarupa. Purva Rupa (Purva = prior; Rupa = features), as per Ayurvedic understanding, are the subtle clinical features which arrive before the full manifestation of a disease. These may be considered as the telltale signs of the upcoming disease in the normal course of pathogenesis progression. For an Ayurvedic physician, however, Purvarupa also arrive as an opportunity to act early and proactively through their timely identification which may remain unnoticed in case of unawareness about such features and their relation to upcoming disease. Any retrospective presence of Prameha Purvarupa among diabetes people may come as a clue about the possible appearance of such features as a consequence of the process of diabetes development. Such knowledge may eventually help us developing an advisory on the basis of such warning features as the telltale of upcoming diabetes. A timely observation may eventually help one make effective changes in the lifestyle and other routines so that the pathogenic progress may be arrested. The other approach to prevent diabetes could be more generic and is based on the prevention of risk factors found to have an association with the development of diabetes. Identification of the risk factors having a potential of promoting the development of diabetes in future and finding the effective ways to reduce those risk factors could therefore be the first practical measure required to be taken in this situation. Type 2 diabetes precipitates through a complex multifactorial process incorporating multiple lifestyle and food-related factors. Randomized clinical trials have demonstrated that type 2 diabetes can largely be prevented through diet and lifestyle modifications. Personalized primary prevention among high-risk individuals to prevent the transition to overt diabetes is therefore an attractive alternative to reduce the diabetes-related morbidity and mortality. To make a feasible translation of this hypothesis, this is however important to identify the high-risk individuals among the general population. Many efforts have been made to identify such risk factors on the basis of population-based surveys and cohort studies. This is noticed that for diabetic patients, most of such studies focused around sedentary lifestyle and high-calorie diet as potential precipitating factors. It is, at this point, interesting to note that Ayurveda proposes an exhaustive list of possible factors leading to Prameha in general and Madhumeha in particular, a condition akin to diabetes of modern biology. Besides lifestyle and dietary factors, few other noteworthy factors from Ayurveda leading to diabetes are Vegadharana (suppression of natural urges); stress, anger, and sleep disturbances. Ayurveda also proposes a genetic linkage of diabetes by indicating it as a Sahaja (present since birth)and Anushangi (irreversible and progressive) disease. Considering the diverse etiopathogenesis of diabetes, such additional causes look important and are required to be enquired if they also play a role in diabetes precipitation. Within a population pool, large number of confounding factors may work together relating to the precipitation of diabetes. This is however obvious to see that among those exposed, only those who are genetically susceptible, develop diabetes in the subsequent part of their life. This susceptible “prediabetic” population has become the focus of diabetes prevention studies worldwide for its possibility of preventing or delaying the impending diabetic conversion through identifying the links between various confounding factors such as food and lifestyle and diabetes. After a thorough review of Ayurvedic literature to list all possible risk factors enumerated as the Hetu (causes) of Prameha and Madhumeha, a case–control study was planned to see any predominance of such factors in a recently diagnosed diabetes population comparing to the healthy matched controls. The study was able to show alarming association between many such factors which had been repeatedly stressed by Ayurveda for their possible association with Prameha but have not been translated so far contextually for its practical usage. This is an observational matched case–control study. The “case” for the present study was defined as a newly diagnosed (of not >2 years duration between the first diagnosis and the time of registration) case of type 2 diabetes with no complications or no other coexisting significant illness. Symptoms of diabetes + fasting plasma glucose level ≥126 mg/dl (fasting is defined as no calorie intake for at least 8 h). Plasma glucose fasting equal to or more than 126 mg/dl. The cases were recruited from the State Ayurvedic College and Hospital, Lucknow. It included the patients fulfilling the eligibility criteria attending the hospital within the specified study period. Besides this, the cases were also recruited from the general population on the basis of eligibility measures establishing the diagnosis of type 2 diabetes. Patients willing to participate in the study. Patients not willing to participate in the study. “Controls” for this study were the people fulfilling all the eligibility criteria as was established for “cases” except that they were healthy (nondiabetic as well as not having any other disease grossly affecting the lifestyle and food habits). Controls belonged to the same age group and were obtained from the same population pool. By definition, the controls were normal healthy volunteers having an equal opportunity of getting exposed to all the risk factors under the inquiry of this study as the possible factors leading to type 2 diabetes. Every control was investigated to assure them not being suffering from the type 2 diabetes. A random plasma glucose (RPS) test was done on every control for this purpose with the help of a glucometer (Accusure). Those who had the normal range of RPS were recruited for the study. Controls were selected from the nearby healthy population and the recruitment was done within a specified period of the study. Healthy volunteers not having type 2 diabetes or any other specific illness affecting their food and lifestyle choices! Persons willing to participate in the study. Volunteers not willing to participate in the study. A thorough review of all etiological factors related to Prameha mentioned in Brihattrayi (three renowned classics of Ayurveda, namely, Charaka Samhita, Sushruta Samhita and Ashtanga Samgraha) was done. Concerned factors were identified and grouped under various categories such as lifestyle related, food quality related, and food intake related. Textual references were simplified into common language with the help of Sanskrit language experts and then it was appropriately edited. On the basis of this simplified text, a detailed questionnaire was framed in order to explore various lifestyle and food-related tendencies among the enrolled participants. Initially, the questionnaire contained 14 questions related with lifestyle and 27 questions related with food quality and intake. This questionnaire was subjected to a content validity and feasibility analysis through a pilot test. Subsequent to the pilot test, appropriate language corrections and modifications were done in the questionnaire and a final questionnaire containing 14 lifestyle-related questions and 32 food quality and intake-related questions was prepared. The cases were screened as per the inclusion criteria from State Ayurvedic College, Lucknow, and from nearby area with the help of some private practitioners. To inform the prospective participants for registration in the study, notifications and banners were placed at few points in the concerned hospital. Controls were registered from the healthy population working or studying at State Ayurvedic College, Lucknow. Additional controls were registered from the healthy population residing nearby. Every registered case or control was given the questionnaire developed for the study and was asked to give the most appropriate reply in reference to the particular question. The interview was carried out by a qualified Ayurveda physician who was involved in the process of questionnaire development. The interviewer remained available during the process in order to resolve any query related to any question. The completion of the questionnaire in each case took about 25 min in average. On the completion of the study, all the questionnaires were screened for their completeness or incompleteness and subsequently subjected to the appropriate data analysis. Relative risk assessment in the study was done with the help of obtaining odds ratio (OR) of association of specific risk factor with a definitive outcome. This OR is calculated considering confidence interval as 95%. Besides this, a demographic analysis of cases and controls in reference to their age and gender was also done. The OR analysis was initially planned to be done on a case to case match basis, but practically, it was done as a group match in two distinct age groups matched with gender. In total, 82 patients of recently diagnosed type 2 diabetes fulfilling the inclusion criteria for the study were screened for the participation in this study. Among these, 50 had given their consent for participation. On introduction of the questionnaire designed for the study, five prospective participants expressed their inability to complete it because of the time required for its completion. Therefore, 45 patients were finally enrolled in the study and were given the questionnaire for their respective responses. Among these, 12 responses were found incomplete and hence eliminated from the study. Rest 33 responses were analyzed statistically. Approximately, 100 normal healthy people fulfilling the criteria of control as specified for the study were approached for their possible participation in the study. Among them, 80 have given their consent to participate. Among those, 20 subsequently refused to participate because of lack of time. Responses of 60 control participants were finally recorded. Among these, 8 responses were found incomplete and hence eliminated from analysis. Rest 52 completed responses were used for further statistical analysis [Figure 1]. Among 33 registered cases, 25 were male (75.8%) and 8 were female (24.3%). Among 52 controls, 31 were male (59.6%) and 21 were female (40.4%). To make a better analysis of the data, 1:1 match was adopted for cases and controls. Initial matching was done on the basis of gender determination, and subsequently, the age matching was also done by considering the whole population of case and control into two major groups, namely, younger age group (30–40 years) and older age group (41–50 years) [Table 1] and [Table 2]. As a result, 24 matching pairs of cases and controls were identified that were further considered for the statistical analysis. Among all the questions inquired in the interview, 18 turned out to be of relevance to the study outcome [Table 3]. Among all the inquiries made, stress and anxiety (OR: 7.86:1), anger (OR: 5.9:1), irregular food intake in terms of timings (OR: 3.8:1 and 3.5:1), exposure to heat (OR: 4.6:1), consumption of milk (OR: 3.5:1) and curd (OR: 4.2:1), and consumption of excessive liquids (OR: 4.52:1) were found more associated with diabetes occurrence comparing to their absence. Among these all factors showing a high OR, stress and anger were found statistically significant (P = 0.0173 and 0.0145, respectively). The study could not reveal any significant association of sleep disturbances, skipping of meal, excessive sitting hours, and consumption of Ghrita (ghee) and meat with the occurrence of diabetes. Exercise and exposure to sunlight were found partially protective from diabetes although not to the extent of statistical significance (OR: 1:2.87 and 1:2.14). An elaborate description of etiological factors (Hetu or Nidana) referring to various diseases is something unique to Ayurveda. Most Ayurveda texts, for this purpose, have dedicated complete chapters in the section of Nidana dealing precisely with various causes of disease and the clinical presentations in accordance with different causes. Such causes sometimes are elaborated generically, referring to a class of pathogenesis, for example, the factors causing a particular Dosha excess or depletion leading to the pathogenesis marked by such Dosha excess or deficit. Such causes and their effects can be precisely understood on the basis of hyper- and hypofunctioning of the designated Dosha. Such pathogenesis where a clear cause and effect relationship could be established on the basis of existing knowledge is precisely called as Prakriti Sama Samaveta pathogenesis. On the other hand, there can be factors, directly incriminating a specific outcome in the form of a disease. Such Hetu may be pathognomonic for a particular disease although may not be explainable on the basis of usual Dosha Dushya connotation. This is however largely agreed that, whatever the cause of a disease may be, the first principle of treatment always remains the same and revolves around the aversion of causative factors. Causative factors for aversion, in this context although look highly promising to avoid diseases at one end and to promote the healing on the other, are actually highly complex to be translated in the practice in the absence of studies establishing the cause and effect relationship between the proposed cause and eventual outcome to its exposure. 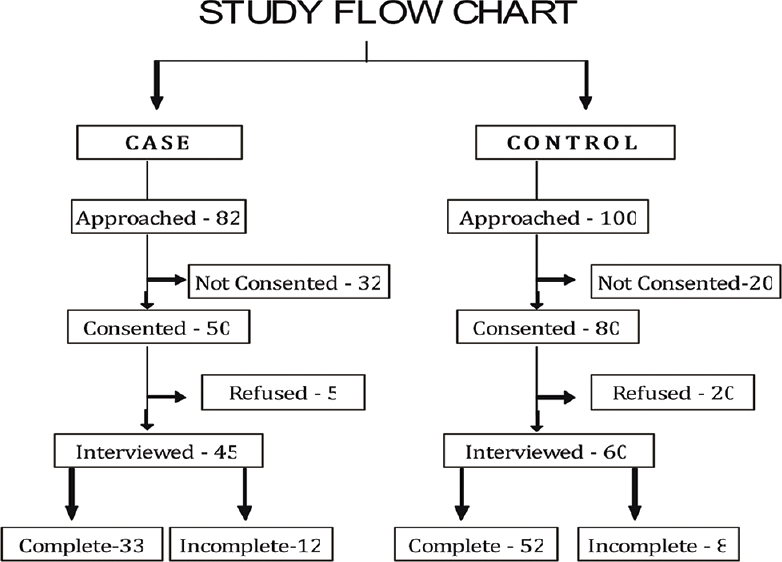 Observational studies such as case–control or cohort studies in a prospective or retrospective manner may eventually give a clue in such conditions to establish a possible link between the proposed cause and the outcome in question if a high association is found in cases comparing to the identical controls. Working on the similar principles, this case–control study was able to find some alarming associations between a few food and lifestyle-related factors as are depicted in Ayurveda for their possible association with diabetes. Importantly, many of these factors explored in the study for their possible links with diabetes have not previously been explored and hence remained unnoticed so far. Association of anxiety (Udvega), grief and stress (Shoka), anger (Krodha), habit of untimely food intake (Vishamashana), and taking meal before the digestion of previous meal (Adhyashana), excessive exposure to heat and fire, and consumption of specific foods such as milk and its products including curd with diabetes was found higher in the study among the people suffering with diabetes comparing to the normal healthy controls. The study proposed stress as the single largest factor having a strong association with diabetes. An OR of 7.86:1 among cases and controls for having exposed to high stress or not was clearly indicative of 7.86 times greater possibility of developing diabetes among those who are highly stressed. Stress has long been known for its detrimental effects on metabolism. The effects of stress on glucose metabolism are mediated through a “counter-regulatory” mechanism resulting in elevated plasma glucose levels and decreased insulin action. Further to this, in diabetes, because of a relative or absolute lack of insulin, stress-induced increase in plasma glucose does not get adequately metabolized. Hence, stress remains a potential contributor to chronic hyperglycemia in diabetes responsible for many of its complications. Stress also results in erratic eating behavior causing weight gain and hence exposing the person on a direct risk of diabetes due to subsequent insulin resistance. The study proposes pervasive anger as another potential cause linked with diabetes. The OR between pervasively angry mood and its absence was 5.9:1 suggestive of about six times higher possibility of developing diabetes among those having bad temperament. Anger can be extremely destructive emotion with a detrimental impact on physiology as well as on mental and emotional well-being. Anger initiates the stress response within the body causing blood sugar levels to rise. This is how anger also proposes to be a potential contributor to chronic hyperglycemia in diabetes. Untimely, food intake is also a commonly seen eating practice today. The study has shown that this habit of untimely food intake was more prevalent in cases comparing to the controls. People having frequent practice of untimely food intake were found 3.8 times more susceptible for developing diabetes compared to those who had a regular and timely food intake habit. Eating at inappropriate time is a real health risk and diabetes is one among them. It should be understood that diabetes is essentially the inability to maintain uniform glucose levels in the body. Food habit that induces unwanted changes in blood glucose levels is eating at irregular intervals. Insulin action usually rises and falls rhythmically in accordance to the biological clock. Major meals, therefore, are required to be eaten at almost same time to prevent fluctuations in blood sugar levels. An inappropriate and irregular meal pattern may disrupt the biological rhythm of insulin release and may lead to erratic glucose metabolism. Food reintake before the previous one is digested (Adhyashana) is one specific etiology perceived by Ayurveda as the cause of many diseases. An OR of 3.5:1 noted for this observation referring to diabetes proposes that people having a food reintake habit without allowing the previous meal to digest have 3.5 times greater possibilities of developing diabetes. Although association of Adhyashana with various diseases finds a thorough mention in Ayurveda, modern science fails to identify any such etiology and its association with diseases. Continuous long duration exposure to heat and fire is another etiological factor proposed to be associated with diabetes. Such exposure may be common among people who are occupationally exposed to excessive heat and fire for long durations. A 4.6:1 OR obtained in this case was highly suggestive of a greater possibility of developing diabetes among such people. Although less work has been done in the area of influence of ambient temperature on the possibility of development of diabetes, cold-induced thermogenesis is found to improve insulin sensitivity. Increased outdoor air temperature is found to be associated with higher risk of gestational diabetes mellitus. This can, therefore, be speculated that a higher ambient temperature may be associated with reduced insulin sensitivity eventually increasing the possibility of developing diabetes upon a regular exposure of this kind. This observation seems highly relevant seeing the continuous rise in global temperature due to global warming and also a continuous global rise in diabetes prevalence. A high liquid intake in the form of tea, coffee, juices and cold drinks was also found associated with higher possibility of diabetes development. An OR of 4.52:1 was noted for this association suggestive of a 4.52 times higher possibility of developing diabetes among those with high fluid intake comparing to those who are not. Several prospective studies have been conducted to examine the relationship between fruit juice intake and risk of incident type 2 diabetes, but results have been mixed. A systematic review and meta-analysis however have supported the speculations that an excessive intake of beverages is linked with higher incidence of diabetes. Despite the efforts made at stages of planning, execution and analysis, this was observed that the study contained few limitations. This is pertinent to view the results of the study in light of these limitations to draw a more realistic inference. The primary limitation the study faced was of inadequate sample size. Although, initially, the study was proposed to be done on 374 participants with 187 each as cases and controls, this could not be obtained for many reasons. Being an observational study devoid of any intervention, it was difficult to convince the individuals to participate in the study. A better plan therefore should have been employed to engage adequate sample numbers belonging to case and control category. Identifying the risk factors for their possible association with a pathogenesis could be the first reliable step to prevent a disease. Prevention strategies often fail to act in a desired way due to the lack of conclusive association of a cause and effect relationship between a disease and its proposed cause. Even if such relation exists, lack of a realistic temporal relationship between the exposure and the possible outcome also limits the practical application of such knowledge as a strategic tool to prevent the disease. For diabetes, this is largely agreed that in view of rapid increase of its prevalence and also in view of a large population pool of prediabetes individuals which is just a step behind the actual diabetes pathogenesis, prevention could be a most pragmatic method to deal with. There had been many studies attempting to screen such risk factors although the focus of most of such studies remained limited to high-calorie food and lack of exercise. Ayurveda is seen to have documented a series of causative factors incriminated as the cause of Prameha although it was never attempted earlier to see any realistic association of such causes with the actual disease. This study therefore seems to be the first of its kind exploring the association of Hetu and the disease in a case–control manner. Remarkable associations found between stress, anger, and excess heat exposure with diabetes are a few causes which Ayurveda proposes as the possible cause of diabetes although not much explored in conventional understanding. A serious effort therefore is required to be made toward establishment of association of Ayurveda concept of causes and diseases. Any such establishment may be crucial to prevent the disease like diabetes which is increasing globally in pandemic proportions. The authors wish to express their gratitude to Dr. Mohan Chandra Bhatt for his extreme help in understanding the classical Sanskrit verses and translating them into the language of common understanding. Kind help of Dr. Atul Kharbanda is also acknowledged in helping recruiting the cases for the study. International Diabetes Federation, editor. IDF diabetes atlas. In: A Book. 6th ed. Brussels, Belgium: International Diabetes Federation; 2013. Kaveeshwar SA, Cornwall J. The current state of diabetes mellitus in India. Australas Med J 2014;7:45-8. Mohan V, Madan Z, Jha R, Deepa R, Pradeepa R. Diabetes social and economic perspectives in the New Millennium. Int J Diabetes Dev Ctries 2004;24:29-35. Ahlqvist E, Storm P, Käräjämäki A, Martinell M, Dorkhan M, Carlsson A, et al. Novel subgroups of adult-onset diabetes and their association with outcomes: A data-driven cluster analysis of six variables. Lancet Diabetes Endocrinol 2018;6:361-9. Sheridan K. The 20 Most Goggled Diseases. Available from: https://www.statnews.com/2017/06/06/the-20-most-googled-diseases/. [Last accessed on 2018 May 20]. World Health Organization 10 Facts about Diabetes; 2013. Available from: http://www.who.int/features/factfiles/diabetes/en/. [last accessed on 2018 Aug 20]. Dutta D, Mukhopadhyay S. Intervening at prediabetes stage is critical to controlling the diabetes epidemic among Asian Indians. Indian J Med Res 2016;143:401-4. Dutta D, Mukhopadhyay S. Novel diabetes subgroups. Lancet Diabetes Endocrinol 2018;6:438. Horowitz CR, Eckhardt S, Talavera S, Goytia C, Lorig K. Effectively translating diabetes prevention: A successful model in a historically underserved community. Transl Behav Med 2011;1:443-52. American Diabetes Association. Standards of medical care in diabetes-2014. Diabetes Care 2014;37 Suppl 1:S14-80. Nowotny B, Cavka M, Herder C, Löffler H, Poschen U, Joksimovic L, et al. Effects of acute psychological stress on glucose metabolism and subclinical inflammation in patients with post-traumatic stress disorder. Horm Metab Res 2010;42:746-53. Järvelä-Reijonen E, Karhunen L, Sairanen E, Rantala S, Laitinen J, Puttonen S, et al. High perceived stress is associated with unfavorable eating behavior in overweight and obese Finns of working age. Appetite 2016;105:249-58. Golden SH, Williams JE, Ford DE, Yeh HC, Sanford CP, Nieto FJ, et al. Anger temperament is modestly associated with the risk of type 2 diabetes mellitus: The atheroslcerosis risk in communities study. Psychoneuroendocrinology 2006;31: 325-32. Mekary RA, Giovannucci E, Cahill L, Willett WC, van Dam RM, Hu FB, et al. Eating patterns and type 2 diabetes risk in older women: Breakfast consumption and eating frequency. Am J Clin Nutr 2013;98:436-43. Booth GL, Luo J, Park AL, Feig DS, Moineddin R, Ray JG, et al. Influence of environmental temperature on risk of gestational diabetes. CMAJ 2017;189:E682-9. Xi B, Li S, Liu Z, Tian H, Yin X, Huai P, et al. Intake of fruit juice and incidence of type 2 diabetes: A systematic review and meta-analysis. PLoS One 2014;9:e93471.